Supporters and relatives of the Morong 43 today held a caravan to Camp Bagong Diwa in Bicutan to visit the detained health workers and call for their immediate release. Some 40 vehicles joined the motorcade which started from Quezon Memorial Circle at around 8am. The Philippine caravan coincided with actions in New York, Los Angeles, San Francisco, Ottawa and Vancouver, Canada, Saudi Arabia, Denmark, Netherlands and New Zealand. Upon reaching Camp Bagong Diwa, the supporters of the 43 were surprised by the blockade conducted by the police belonging to the NCRPO. Earlier, church groups were also prevented entry. The church groups included a Protestant bishop and Catholic nuns . As I approached the officer at the gate, I noticed the sign posted on the railings: RED ALERT, it said. The whole camp was placed on RED ALERT probably due to the recent travel advisories on “terrorism”. There were scores of policemen at the gates and the entry of vehicles was restricted. 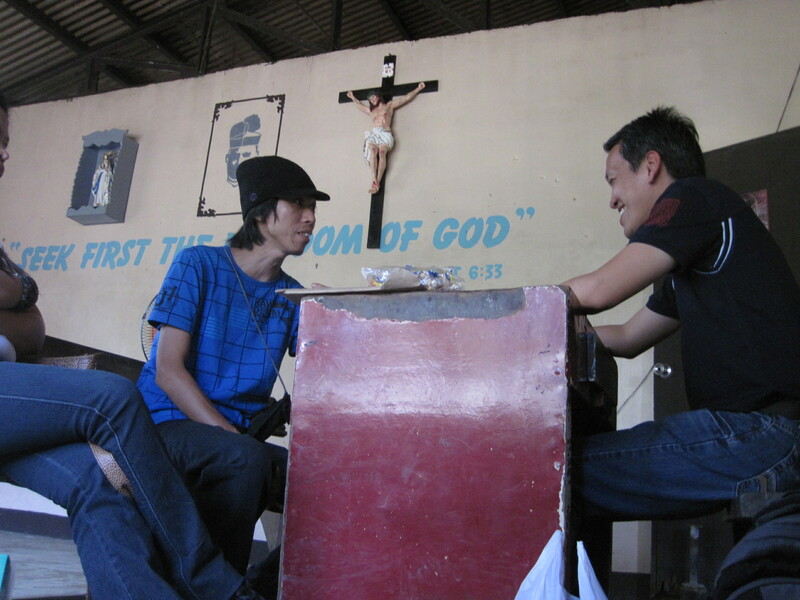 We told the officers at the gate that we had been given a permit by the BJMP to hold a religious service inside and visit to the Morong 43 detainees. Camp Bagong Diwa is the headquarters of the PNP’s NCRPO but inside is also the BJMP compound for detainees. The officers of the NCRPO refused to recognize the permit given by the BJMP. For more than an hour, they refused us entry, citing no clear reason (it’s like we were some sort of terror threat to them). The camp commander, a certain Gen. Regis, refused to meet us despite repeated requests. I told the officers at the gate that I had personally informed NCRPO chief Gen. Nicanor Bartolome who was in Washington at the time that we would be arriving today. Gen. Bartolome texted that he will be informing his deputy, a certain Gen. Regis. The PNP would not budge and showed no interest in accommodating the visitors despite a BJMP permit. This forced the participants of the caravan to block the gates of Camp Bagong Diwa. Shouts of “FREE THE 43” were soon heard in Bicutan. Placards and pictures of the detained health workers were raised at the gates of the police camp. Since the PNP was already on red alert, they were immediately able to deploy about probably two platoons of anti-riot police to block the protesters. Tension ensued. The supporters of the 43 felt truly insulted by the response of the PNP. The PNP began pushing the protesters back, who in turn pushed back at the PNP. The tension was only resolved when the protesters gave way to vehicles who were exiting Camp Bagong Diwa. At that point, the PNP still had no clear answers as to why they were blocking the Morong visitors. We were being given a lot of bureaucratic crap. After some time, the warden of the BJMP facility came out to meet us and explained the limited space for visitors inside the detention facility. He said it would be best to visit by batches of 25. We agreed with the assurance that all those who wanted to visit will be accommodated. We boarded the BJMP vehicle together with past and present partylist representatives, members of human rights groups and the health sector. We were brought to the compound for male detainees. We were able to enter without any incidence. Since visits would be conducted by batches, we decided to make our visit short to be able to accommodate the other visitors. We had a short program and the visitors gave their solidarity messages. Ka Satur Ocampo called on the detainees to be steadfast, saying that he himself was detained for nine years during martial law. We then proceeded to visit the female detainees. They were happy to see us. They had watched the blockade and tension at the gates, live on TV, in a flash report. We were joined by directors Bibeth Orteza and Carlitos Siguion-Reyna and artist Kiri Dalena. The female detainees were in their usual high spirits, singing Martsa ng Bayan and given a very emotional interpretation of a Joi Barrios on desaparecidos. The poem moved Bibeth to tears, as it had been part of the “Mrs. B” monologue wherein Bibeth played Mrs. Burgos, mother of the missing Jonas. The detainees then sang happy birthday to Carlitos. The meeting was short but you could see from the faces of the detainees that they were agitated and they believed that our struggle outside prison will set them free. Malen Serrato, a schoolmate from UP and member of the Center for Nationalist Studies, told the visitors that they may be imprisoned physically but their minds and hearts were free. We went back to the gates of Bagong Diwa to find the relatives lined up waiting for their turn to visit. The relatives were brought to the detention facility but were brought back to the gates. This incensed the relatives because no explanation was given why they were being brought back. The PNP later explained that there had been some miscommunication or lapses and that they merely wanted the process to be followed. One officer, a certain Col. Mabanag even threatened the relatives that they will all be arrested if they staged a rally inside Camp Bagong Diwa. Yes, this jerk was issuing threats for incidents that have no basis whatsoever. I left Camp Bagong Diwa after the PNP confirmed that the relatives would be allowed to visit the detainees. We were exhausted for some reason but we left also in high spirits. Our struggle continues until the 43 are free. The following links contain posts during the first three weeks in the fight to FREE the 43. These include the fact sheet on their illegal arrests, the habeas corpus petition before the Supreme Court and Court of Appeals, the filing of a complaint before the Commission on Human Rights, and the outrage and protests and solidarity for the the cause of the 43. Nine months since, the DOJ under Sec. Leila de Lima has submitted its recommendations on the case of the 43. President Benigno Aquino has publicly admitted the searches and the evidence derived from them may not be admissible and hence no case can prosper. The nation awaits the action of the President on the DOJ recommendations. 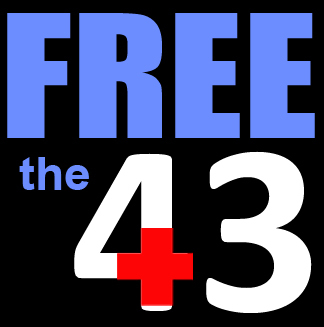 Filipinos and friends around the world continue to press for the immediate release of the 43. When President Benigno Aquino III speaks at the ASEAN Summit in Hanoi, Vietnam on October 28-30, he is expected to talk tough on human rights, according to the Department of Foreign Affairs. Among others, Aquino is expected to call for the unconditional release of all political prisoners including Aung San Suu Kyi of Myanmar. 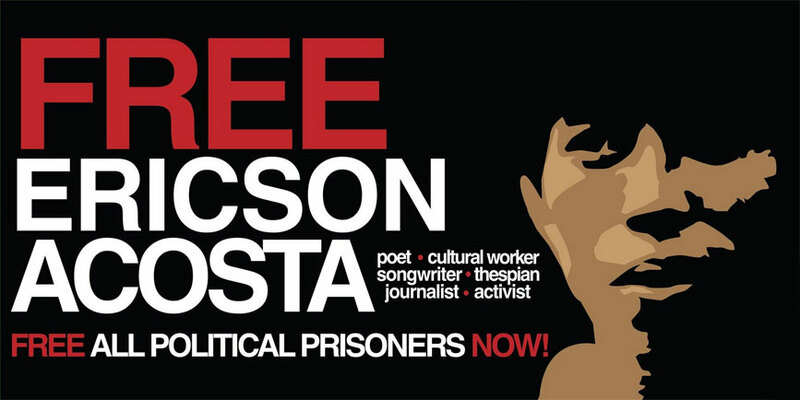 Aquino however will be hounded by the case of political prisoners in his own country. The Philippine president leaves for Vietnam on Tuesday. When President Aquino takes the stage in Hanoi and talks about human rights and political prisoners, the world will also be asking about the political prisoners in his own country. He will be talking about freeing Aung San Suu Kyi but questions will remain on why he hasn’t acted to release the Morong 43. Mr. Aquino can show the way to other Asian countries by releasing political prisoners in his own country. The case of the Morong 43 has garnered international attention from various rights groups. Now would be a good time for Mr. Aquino to back up his pronouncements on human rights with concrete action. 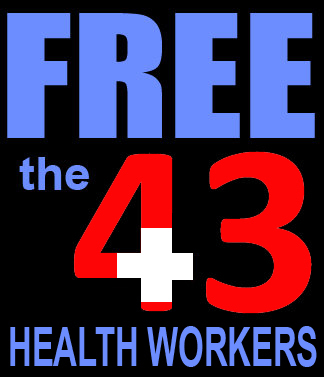 The Philippine Department of Justice has submitted its review and recommendations on the case of the 43 health workers arrested last February 6. The review has the effect of a reinvestigation of the case and now awaits the approval of the President. It would be a supreme irony if Pres. Aquino speaks on human rights and Suu Kyi while some 300 political prisoners including the Morong 43 languish in Philippine jails. We would want to see the 43 reunited with their families this Christmas. There is already sufficient legal basis to withdraw the charges against the 43 so that the courts can order their immediate release. Below is the transcript of the answer of President Benigno Aquino to a reporter’s question regarding the DOJ’s review of the case of the Morong 43. This was issued today. Reporter- Ano po laman ng review ni Justice Secretary Leila de Lima on the case of the Morong 43 at anu-ano na po ang magiging action ng Executive dito? Aquino – Well, we had a national security cluster meet yesterday. There are issues of ano ‘yung…medyo teknikal nang konti ‘no. Pero bottom line, when you ask for a warrant, there are certain specifics that you have to put in—what do you hope to find? When do you hope to find it? The review basically stated that there was a person that they were reserved a warrant against. That person was not in the resort that was raided. The firearms in particular would fall only in a general classification. ‘Yung explosives were not part of the warrant. So I emphasized to both the Chief of Staff, the Undersecretary representing the Secretary of DND and director-general Bacalzo that we, who are upholders of the law, must be different from those who are beyond the pale of the law, who are outlaws. So it is a generally accepted principle that…’yung concept ng lawyers is called the fruit of the poison tree. ‘Yung evidence that are wrongly gotten cannot be used, therefore, it cannot prosper. However, the matter is before the courts. Again, nasa jurisdiction nila. So ‘yung courses of action and we would want to rectify that situation but that will have to undergo sanction by the courts that have already taken cognizance of the case. Reporter- Korte na lang ang makapagsasabi kung lalaya na sila anytime soon? Aquino– Hindi naman pwedeng i-utos ng Executive na lumaya sila without the courts’ sanction. My view of the above transcript is that the President seems to acknowledge that the search and arrests of the 43 were illegal and that any so-called evidence resulting from those is inadmissible. This seems to be the positive aspect of this interview. Aquino seems to agree with the DOJ’s de Lima on this one. However, it is not clear what actual action the President will do to correct this injustice, though he said they would want to RECTIFY THE SITUATION but it would have to go through the court processes. What the Executive can do is to order the DOJ to withdraw the cases against the 43 so that the courts can immediately order their release. This can be done ASAP. Mercy Castro, one of the Morong moms is set to give birth anytime soon. The Palace can right a grave injustice and free the 43 before Christmas! Kung gusto palaging merong paraan.